You may not have access to information about the model of your heater. Or perhaps, your heater is an older model that differs in size from its newer cousins. In such cases, you can determine the guard you need by calculating the shape and size of your radiator guard. This article outlines how to calculate radiator guard size in three easy steps. From left: (1) 5-sided wall mounted guard to suit a panel heater (2) 4-sided floor-standing guard to suit a storage heater. A floor-standing heater is a heater that is fixed to the wall but standing on the floor, for example, a storage heater. A floor-standing heater needs a guard with four sides – a front, top and two sides. There is not bottom on this guard because it will be standing on the floor. A wall-mounted heater is fixed to the wall but raised off the floor, such as a panel heater. 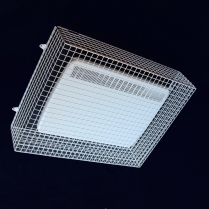 A wall-mounted heater needs a guard with five sides – a front, top and bottom, and two sides. Next you will need to check the key dimensions of your radiator. You should measure the width, height and depth of your heater. If your heater is a floor-standing heater, be sure to measure the distance from the top of the heater to the floor. When measuring the depth of your heater, be sure to measure from the wall to the front of the heater, in case there is a gap between the heater and the wall. Next, you will need to calculate radiator guard size by adding the correct clearance to the dimensions of your heater. Wire mesh guards should have enough clearance to be finger-safe. For the guard to function correctly there must be a safe clearance between the heater and the guard. The guard manufacturer, Aiano, recommends this clearance should be not less than 75mm, (3 inches). For a floor-standing guard, this means the guard should be 150mm wider, 75mm taller and 75mm deeper than the heater. For a wall-mounted guard, this means the guard should be 150mm wider, 150mm taller and 75mm deeper than the heater. 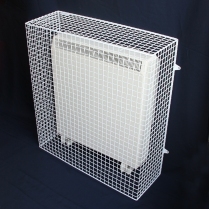 Using the recommended clearance will ensure that the guard is finger-safe, in other words, if adults or children put their fingers through the mesh they will still not be able to touch the heater. It will also reduce the risk of the guard itself becoming too hot. Find your guard or contact us for advice. Once you have identified the shape and size of radiator guard you can search for the correct guard on msguardio.com. If you cannot find the right guard for your heater, contact us for advice and we will be happy to point you in the direction of the best product or provide you with a quotation for a bespoke solution.